Christian did his undergraduate studies at Harvard University, where he was associated with Jonathan Losos’ lab. After graduating, he won a grant to visit the lab and work on frilly lizards. So, Christian had the dream job of chasing frilly lizards in the wild. Well, there was a bit more to it than that. Christian tested the predictions associated with deimatic display theory to explain the function of the frill found on frilled-necked lizards. This involved capturing lizards at night, while they slept, and returning them to enclosures where he could conduct experiments under semi-natural conditions. These experiments consisted of presenting them with a model predator (a raptor) and simulating an attack (non-contact). Christian also took measurements of colour on the frill and standard morphological measurements. Check out Christian’s web page where you can also see his amazing photos. Maider did her PhD in the Departamento de Ecología Evolutiva, Museo Nacional de Ciencias Naturales (MNCN-CSIC), Madrid. Currently, she is based in Australia and previously spent part of her time at the lab working on writing papers from her PhD and thinking about forthcoming projects. However, she spent most of her time in Canberra, at the ANU, working with Megan Head and Michael Jennions. To read Maider’s work and see what she has been publishing about, take a look at her Google scholar page. Sergio visited from the National University of Córdoba, Argentina where he is in the Department of Ecology and Biodiversity. Sergio visited the lab for a 6-month stint and then return in mid-2017 as an Endeavour postdoc. He worked on UV-signalling in blue-tongue skinks and was involved in building a bluey robot with Will Bailes, an engineering student at Macquarie. Find out more about Sergio’s work on his ResearchGate page. 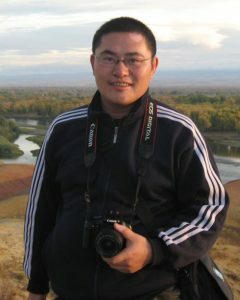 Dr. Feng Xu is from the Key Laboratory of Biogeography and Bioresource in Arid Land (KLBB), Xinjiang Institute of Ecology and Geography, Chinese Academy of Sciences (CAS). 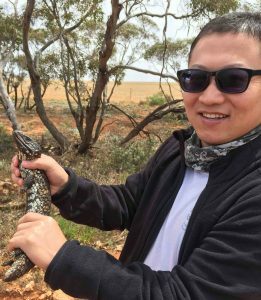 Feng visited the lab for a year and worked on social learning in lizards. His research has three main areas: 1) conservation biology of birds and big mammals; 2) behavior of lizards and birds; and 3) life history evolution of amphibians and reptiles. In the past ten years he has surveyed the distribution range and population size of some endangered species of birds and big mammals in northwest China such as Falco cherrug, Chlamydotis undulata, Panthera uncia, and Capra sibirica. By doing this, he has provided first-hand data on the status of these endangered species in China. He has also studied the evolution of large body size of a frog on islands. More recently, his research has focused on animal behavior. He is interested in how an animal’s behavior is affected by predators and human disturbance. 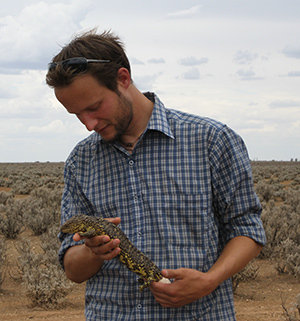 Stephan first visited the lab in order to initiate a collaborative project with Martin on signalling in sleepy lizards (Tiliqua rugosa) and its integration into social networks. 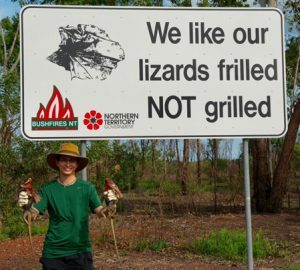 In 2015 Stephan was based in Sydney and he joined us to write up his work on the sleepy lizards as part of his postdoc with Mike Bull (Flinders). He is currently on a DECRA, hosted by Simon Griffith at Macquarie. Stephan has a broad interest in behavioural ecology, particularly in social behaviour. He is interested in the proximate mechanisms and ultimate factors that drive the evolution of sociality. Social systems in non-model taxa, such as lizards, are particularly interesting because they provide the opportunity to investigate the generality of the theoretical framework on sociality that was largely derived through work on model taxa, e.g. birds and mammals. Recently, he has been using social networks to address fundamental questions on social behaviour. He has been working on the causes and consequences of sleepy lizard social networks, including questions such as whether sociality is driven by resource sharing and how parasites move through a transmission network. Read more about Stephan’s work and his publications on his web site. At the time of her visit, Sarah was taking a brief sabbatical from her PhD at the University of Vienna in order to visit our lab and do some work on lizard cognition. She was an enormous help, even if the lizards were a bit frustrating at times! 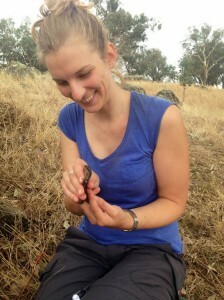 Sarah worked on tree skink (Egernia striolata) learning. At bthe time of her visit, Sarah was writing-up her PhD on personality and social dynamics in crows and ravens in the DK Program Cognition and Communication, University Vienna. Specifically, she studied the role of personality on the social network of a wild population of crows (Corvus corone), on the grounds of the Vienna Zoo (Tiergarten Schoenbrunn). 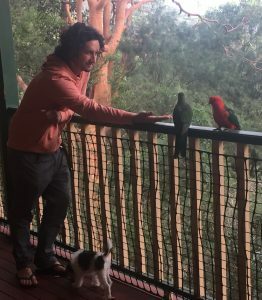 Dr. Qi Yin in the field in Australia! Dr. Qi Yin visited the Lizard Lab for three months to analyse data we collected on our earlier trip to China (see lab blog), and to work on a Eulamprus cognition project. Qi Yin worked on the amazing Phrynocephalus vlangallifor his PhD, which has some of the most complex and spectacular tail waves imaginable. Qi Yin is based at the Chengdu Institute of Biology, Chinese Academy of Sciences and is a long-term collaborator with the lab.